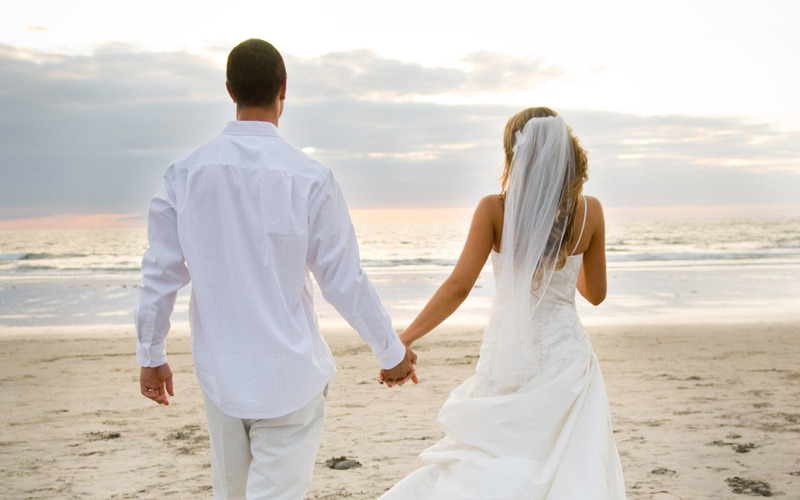 A new study has discovered that your success depends on who you marry. Spouses can greatly affect our decisions that can either make us successful or not. If you want to be successful, you should also consider who you’re going to marry. That’s according to a study carried out by researchers at Carnegie Mellon University. The findings of their study showed that spouses can greatly affect our decisions that can either make us successful or not. In the study published in Personality and Social Psychology Bulletin, researchers studies 163 married couples. Each one from the pairs was given a choice: to solve a simple puzzle or compete for a prize. 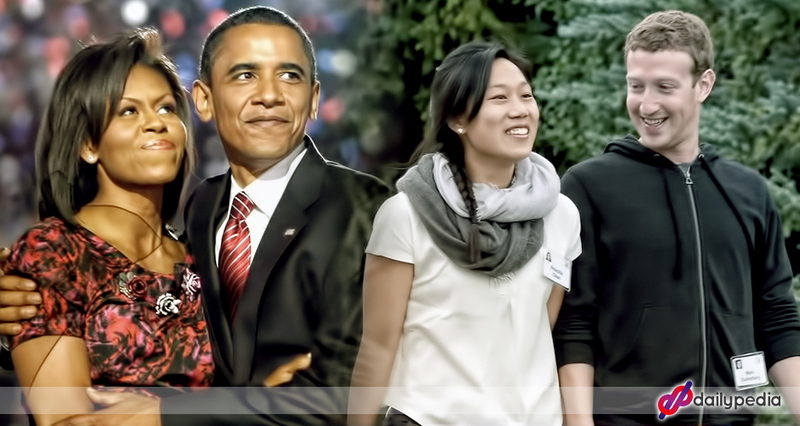 Researchers recorded the couples’ interactions as they both decide which to choose. They discovered that people with more encouraging partners were more likely to take on the challenge and compete for the prize, while those with partners who discouraged them opted to to solve the simple puzzle. Six months following the experiment, they also found out that those who did the more challenging task reported having better psychological well-being, happiness, growth, and better relationships compared to those who solved puzzles. “We found support for the idea that the choices people make at these specific decision points—such as pursuing a work opportunity or seeking out new friends—matter a lot for their long-term well-being,” Brooke Feeney of CMU’s Dietrich College of Humanities and Social Sciences said..
With that in mind, would world’s richest person Bill Gates, Facebook CEO Mark Zuckerberg, former US President Barrack Obama, and music legend Beyonce Knowles achieved the level of success they have now if they were married to another person. A study has found that wives tend to be happier with uglier husbands. Wives with handsome husbands were more likely to follow strict diet and constantly attempt to lose weight for an obvious reason- to look hot for their partners. Do you ever wonder some gorgeous women end up with ugly dudes? 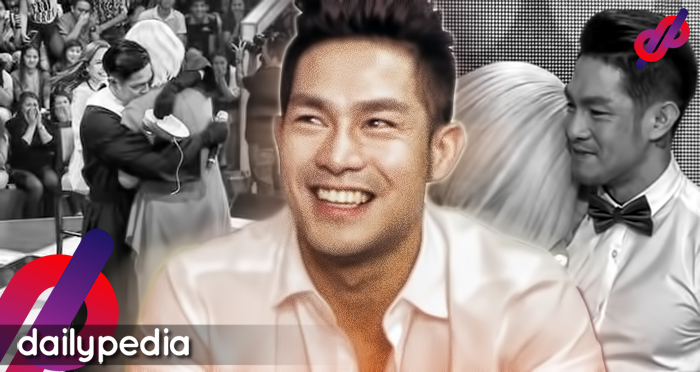 Science has finally confirmed what Filipino rapper Andrew E. has long concluded in his famous 90’s hit Humanap ka ng Panget– women tend to be happier with less attractive husbands. The ugly truth about attractiveness was determined through a study carried out by researchers at the Florida State University. In the study, relationships of 113 newlywed couples in their 20’s were evaluated to determine the role of attractiveness in an individual’s overall happiness. Respondents were asked to to answer a questionnaire about their personal desires to be fit and to diet. Moreover, each respondent was ranked on desirability based on face and body attractiveness. Results showed that wives with handsome husbands were more likely to follow strict diet and constantly attempt to lose weight for an obvious reason- to look hot for their partners. Mison Sere, winner of 2015’s Mr Ugly proudly smiles as fans take a pose with him. Just by thinking about crash diets and rigorous exercises can make one very worried and a little less happy. Meanwhile, wives with less attractive husbands didn’t feel the need to do these things just to please their husbands. Instead, they spend most of their time enjoying life with their not-so-attractive beaus. “The results reveal that having a physically attractive husband may have negative consequences for wives, especially if those wives are not particularly attractive,” researcher Tania Reynolds said. “The research suggests there might be social factors playing a role in women’s disordered eating,” she added. 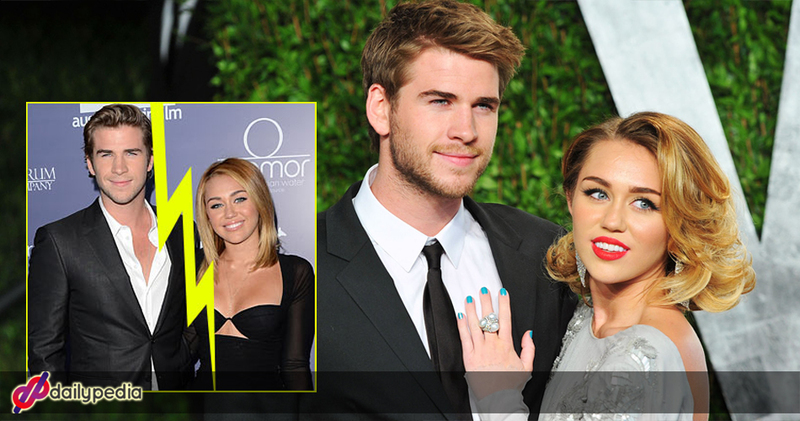 One thing is for sure, Miley Cyrus and fiancé Liam Hemsworth won’t be saying I Do’s anytime soon. According to reports, the power couple decided to postpone their wedding set later this year. 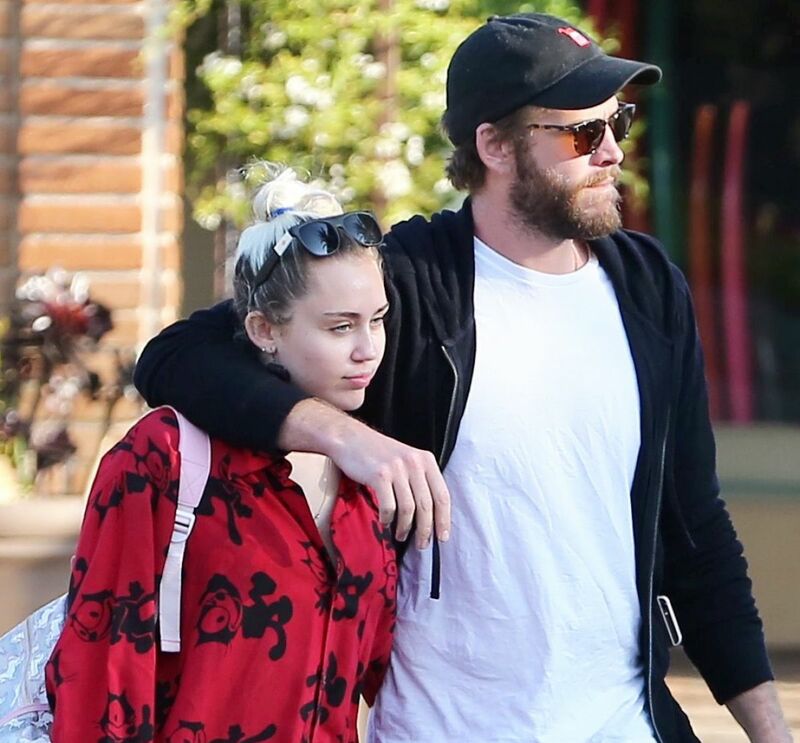 It was also said that the decision was not mutual with Miley not approving it. Liam was said to be overwhelmed with the stress and his future with the popstar. On the other hand, the 24-year-old actress/singer understands why Hemsworth canceled their marriage. It was for their common good but admits frustration with the hunk actor. With the release of her latest album “Malibu”, Cyrus offered another side of her again. Demure look and conservative style of music. She then revealed that she stopped smoking marijuana. Reason behind? All for Liam, I guess? Boo! Cliffhanger. We know, we know. We’ll keep you updated! Every now and then, we hear proposal stories–it has come to a point when it became saturated already. But looking back, every story is unique in its own ways, strategies that we, too, cannot imagine. They are just too sweet that you can never be bitter with it. 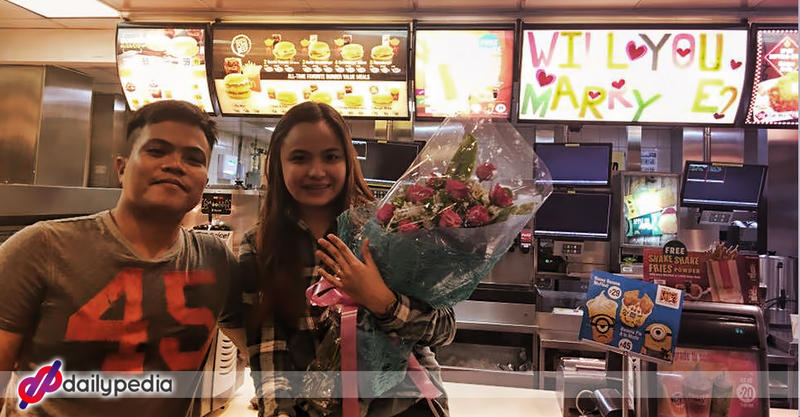 Another viral marriage proposal circulated online couple Frances Dannielle Rodas and Levinjune Solis got engaged at a McDonald’s store. 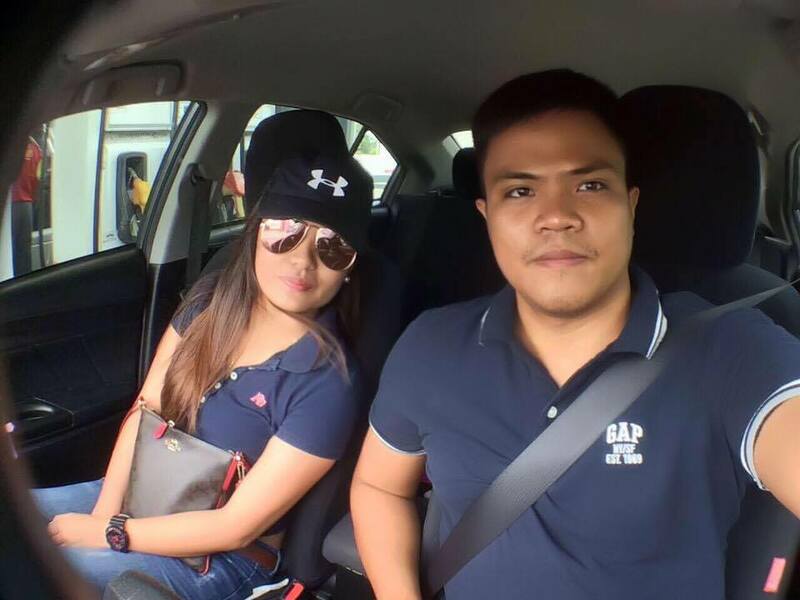 According to Rodas’ Facebook post, she was about to get late for work when her beau asked for a breakfast date. Even though she was so hungry at the time, all she wanted was a sandwich. This is for the fact that she is almost late for work. Solis insisted that they go to the nearby McDo, she gave in. On the counter, she ordered one-piece chicken meal–her favorite. The cashier responsible for their queries asked Rodas if she wanted anything else. She said she’s already good. The female staff insisted her to order more and presented their newest offering. Little did she know, when the staff rolled down the menu, it has a message that would change her life forever. “Will you marry me?” the board said. 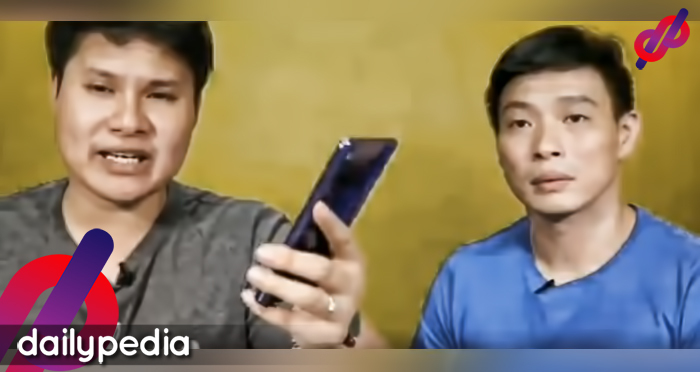 “Sobrang nahihiya ako kasi ang daming tao may mga nag video pa. Basa pa kami sa ulan. 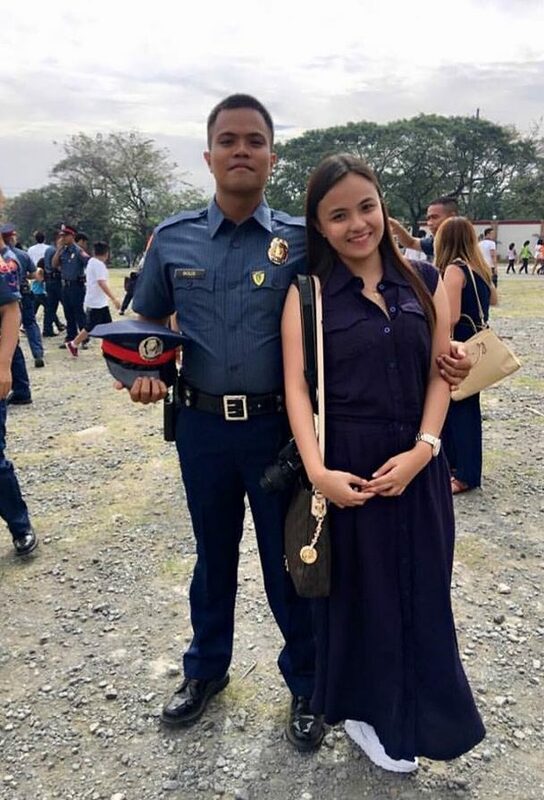 ‘Di man lang ako nakaayos,” she narrated. That’s when the time she sought validation to Solis and the guy popped the question. “It’s a YES, of course,” she ended her story. Sweet, isn’t it? 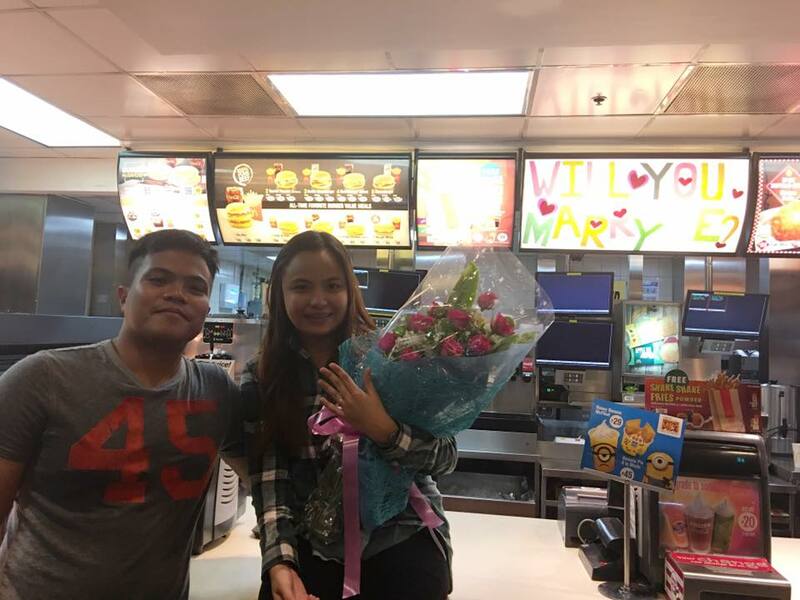 She also expressed her gratitude to the whole McDonald’s crew who made the proposal possible. It is priceless when we post pictures online and everyone appreciated it. However, we surely do know that what we post is open under the scrutiny of everyone, including people we don’t personally know. 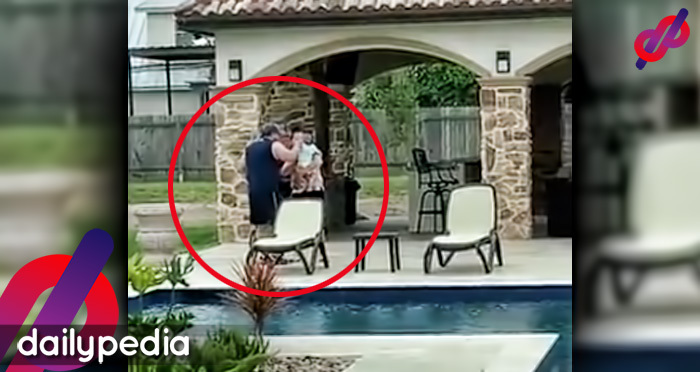 This is a hard life lesson this couple had to face after pictures of them posing naughty while wearing formal clothes went viral online. The poses suggest provocative acts and the photos received negative comments from netizens. A Facebook page posted the picture and captioned it as “pictures taken by a wedding photographer”. The post created a buzz on social media and attracted backlashes because of its unconventional concept. Without any available information about the pictures nor the couple, netizens were quick to draw assumptions. On the other hand, the original tweet that contains some of the photos has been deleted. Due to others’ efforts, the pictures were saved and re-uploaded online. Although it may come that they are just being young and having fun, it is still not enough defense for the bashing to stop. For others, the couple have crossed the line. By this incident, we can learn great life lessons. First, when we upload pictures on social media, always keep in mind that the whole world is just waiting to hate on something. If you think that you might be taken out of context, keep it private or better, do not post them at all! What do you think guys? Think before you click! Watching your wife suffer from sickness is heartbreaking, but seeing her find a new love for you hurts even more. Clare and John Mauremootoo was just an ordinary couple living in Somerset, United Kingdom, until Clare, 39, suffered from a disease that heavily affected her motor neurons. Clare’s death wish is far different from other wishes–for John to find new love so their two kids could be guided by a mother figure. She also wanted someone to look after her husband, keep him company. During her darkest times, she was able to set aside her own feelings and asked the hospital staff at Weston Hospice to help her arrange possible dates for her husband. John, on the other hand, is hesitant to accept his wife’s wish. He is not yet ready to forget what he and Clare had. He wanted to spend more time with her dying wife. They even had a wonderful Valentine’s Date in 2007 before Clare passed away. Five days after their last Valentine’s together, Clare died. Thinking about his wife’s last wish, John did not immediately act on it. He thought about what his sons, Jack (10) and Ben (7) would feel. Months after her wife’s death, John signed up for an online dating website. There, she met Julie Macfarlane, a single mother of two. In March 2008, they decided to move in together. But it took them years to tie the knot, because they wanted their kids to grow first. And in April of 2012, they finally exchanged vows and during their wedding, John spoke about Clare and said he thinks she’s happy now. Happy that he finally fulfilled her death wish. “During my speech, I talked about Clare’s diagnosis and the time we’d spent together, and her wish for me to find someone special. I told everyone I tought Clare would be smiling down on us. She wanted us to be happy and I think she would be, seeing how things turned out,” John said in an interview. Jealousy is normal in every couple’s life, it’s good but it can get unhealthy. Jessica Morris works as a waitress living in Centerville, Ohio. She did not expect she will be causing a buzz on the internet. It’s one normal working day for Jessica in the restaurant she’s working at until a newlywed couple arrived to celebrate their honeymoon. 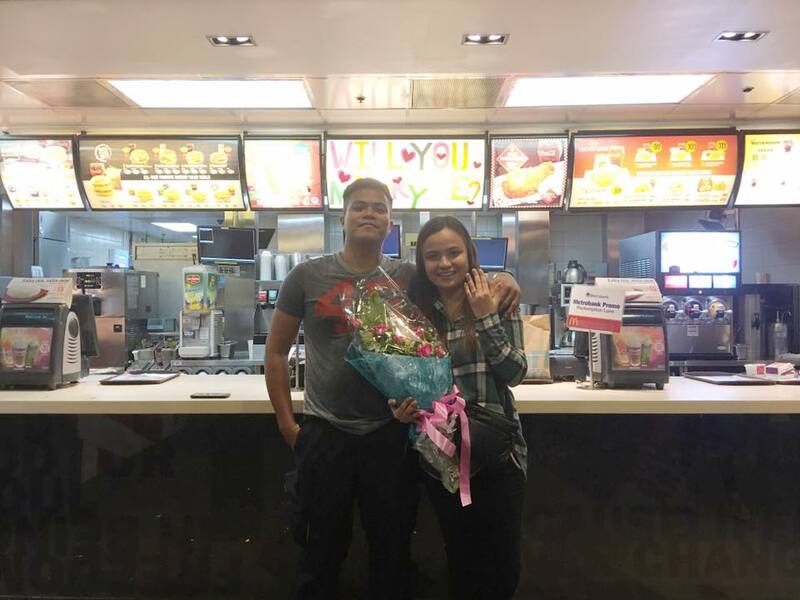 As part of her job, she established a friendly relationship with the couple, helping them what to order, and provided the two with good service. However, when she was asked to get the bill, instead of receiving a tip, she received a nasty comment. A note was written at the bottom of the receipt that says, “He’s my husband! Find your own! Good Luck”. I would like you to know, the server that was in the section across from mine, that I kept talking to and checking on throughout the time of you sitting at my table IS MY HUSBAND. Which I found on my own, and looks better than yours. Also, I would like you to know that I’m sorry MY HUSBAND treated me to a cruise for my honeymoon and not a restaurant. 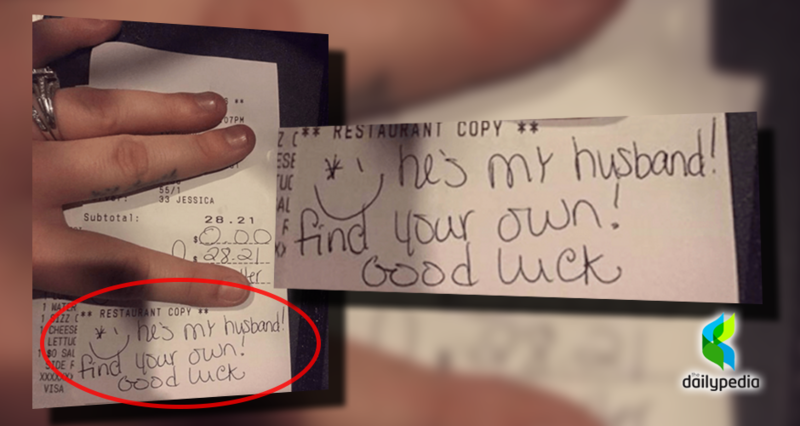 As well as, MY HUSBAND would never let me feel so insecure that I would feel the need to write such a terrible note to a server and make them feel the way you have. So bitter bride, here’s a life tip for you from me, your insecurity as a woman is heartbreaking. Have pride in yourself and your relationship with YOUR husband to where you don’t need to put another down to bring yourself up. Especially a server who lives off her tips and needs them to help her husband pay bills. Also, I hope you like the pen you stole from me, because it’s my present to you. One NEWLYWED to another. P.S – my husband said you can sit in his section next time that way you won’t have to be so worried about your husband “flirting” with a server. Maybe you’ll see his ring a little better than you saw mine. It’s unfortunate how we let jealousy consume us, letting ourselves do things that we would regret in the future. It makes us look so desperate. Did Jessica slay or nah? Let us know. 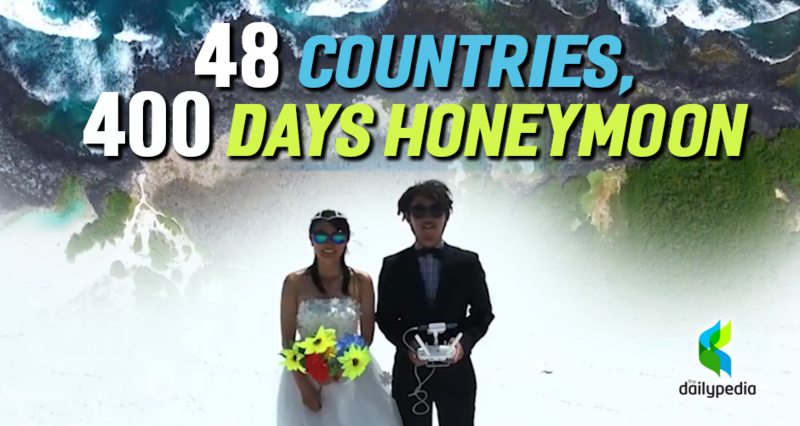 Watch: This Couple Spent 400 Days To Travel 48 Countries, All For Their Honeymoon! Typically, a honeymoon takes a week or a month to celebrate, but this Japanese newlywed takes honeymoon to a different dimension! Kaz and Mariko Yamaguchi hit the global news as they traveled around the world, and recorded their journey using a drone! It took them 400 days to travel around 48 countries. According to Kaz, he did not plan to tape their epic journey, but since he just bought a DJI Phantom 3 Advanced Drone, might as well make use of it, right? According to him, he had insufficient experience in drowning before they started their honeymoon. But as time went by, he figured out that using their newly-purchased gadget is a genius idea. It has captured a wider view of the place they are visiting. Partnered with great music, their breathtaking adventure absolutely left everyone in tears. Some of the 48 places they visited include; Ethiopia, Patagonia, the Amazon Rainforest, Palm Jumeirah in Dubai, the Makgadikgadi Salt Pans in Botswana, the Rock of Guatapé in Colombia, and the world’s largest salt flat, Salar de Uyuni in Bolivia. The video truly sparked the inner wanderlust to its viewers. The high-altitude takes on the moving video absolutely inspired everyone. It brings a new perspective in traveling to people. To find out more about this couple’s epic adventure, you can visit their website, Honeymoon Traveler, and you can check this video on Youtube. In a marriage, it is considered a violation when one of the couple forgets to wear their wedding band. Some couples even fight about it if the offender fails to give a valid reason for doing so since they both expect each other to wear the most vital symbol of their relationship. 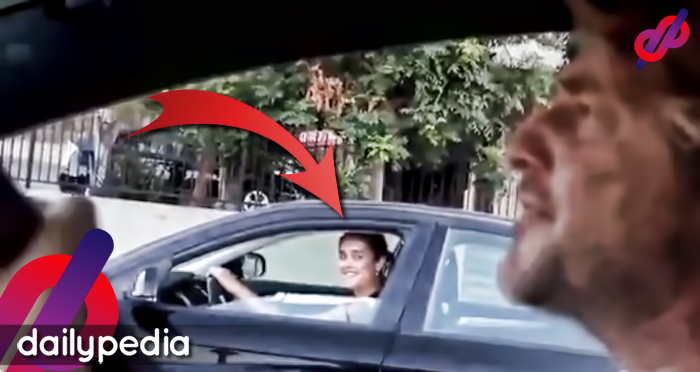 This scenario might have happened to almost every couple and they surely know how hard it is to woo their partners after doing something offensive. On the other hand, this wife made the initiative to give a ‘sanction’ as a disciplinary action to her husband who forgot to wear their ring. 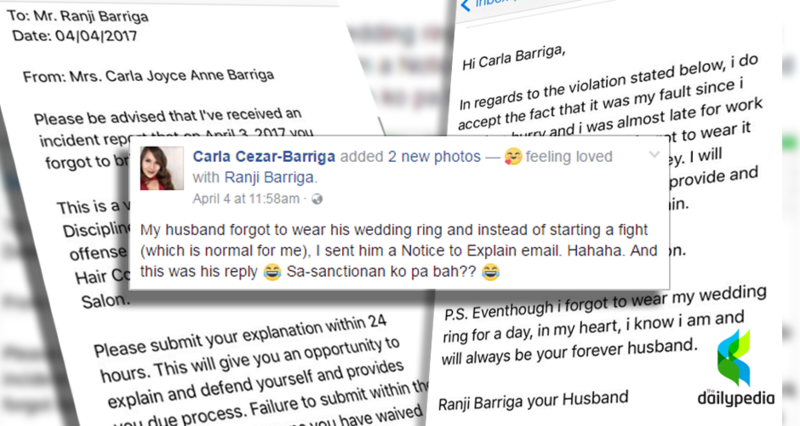 Carla Cezar-Barriga’s Facebook post went viral because of her witty Notice to Explain email to her husband. Along with her post, she included a screenshot of her email which contains detailed information about the wrongdoing he committed and the charges to be imposed for the first offense. 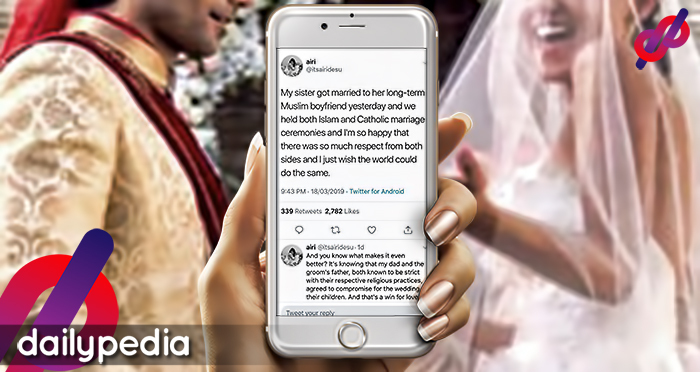 Also, she posted the apologetic response of the offender – and also her husband Ranji Barriga, who willingly gave a satisfactory explanation and accepted the sanction given to him. The people of the internet who have read Barriga’s post found it extremely hilarious and sweet. Some of them even said that they got an idea which they can implement to their partners in the future. Barriga said she did it instead of starting a fight, which everyone agreed to as appropriate and very innovative of her. What she had done is something couples can apply to their relationships, that instead of starting an argument, let the other party explain themselves as to which they can give ‘sanctions’ they prefer.